I was compiling some portfolio pieces today for an illustration bid and I came across this poster I made for a college dormitory. The seed of this poster idea came from my time as a Camp Fire Girl, where I gained the rank of "Bluebird". I attained this distinction by being over six years old when I joined. 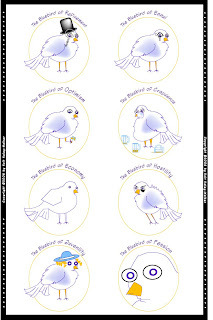 The manual we were given focused on the worth of home and social skills with the "Blue Bird of Happiness" used as a metaphor. The specific content of the manual and the program remains fuzzy in my memory. Ruminating on this mythical bird, it occurred to me that there should be more than one incarnation of the bluebird. Though happiness is a laudable state, perhaps there should be a bird or two that could reflect the particular states of the freshman college student. Really good stuff - don't quite see the connect between ennui (boredom) and that particular drawing - but great stuff. Looks like the beginning of a card line. Thank you! The ennui bird is representative of that special time in a young person's life when they stumble across Sylvia Plath and black eyeliner. Ahh little proto-Goths how cute are you?